Japan Airlines meals have always been known for their creativity, and the latest Air Series menu is sure to impress passengers! 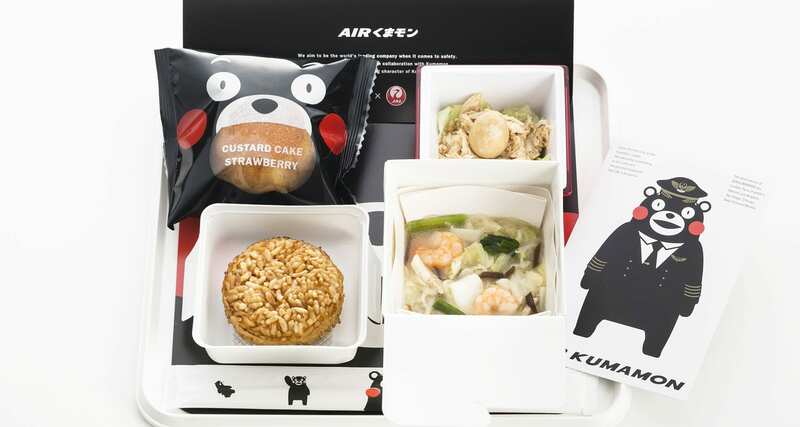 Economy and premium economy class passengers travelling on select Japan Airlines flights from Narita and Haneda will get to experience the latest Air Series menu of Air Kumamon. The Air Kumamon meal tray has been specially designed only for JAL by Mr. Manabu Mizuno using the famous mascot from the Kumamoto prefecture. Served as a second meal service passengers will find a meal offering that has been created by Chef Hayama from Kourantei, an old Chinese restaurant in Kumamoto city. The meal tray will include Vermicelli that is made from mung beans in soup with vegetables and many other fresh ingredients that are typical of the Kumamoto Prefecture in Japan. Also, passengers will indulge in the Kumamon custard cake which is one of the most popular desserts in the region made by Kumamoto Kabo. So how do you get this meal? From the 1st June until 31 August 2014 passengers flying from Narita to New York, Boston, Chicago, Los Angeles, San Diego, Paris, Frankfurt, Helsinki and from Haneda to Paris and London will get to experience this creative inflight meal! To see how creative Japan Airlines have been recently check out their inflight KFC meal here.